Until a cure for all childhood cancers has been found, it is our mandate to improve hospital initiatives to better support patients and their families from diagnosis to survivorship and bereavement. To this end, the Behavioural Sciences Unit (BSU) was established in 2001 to conduct research studies that cover all psycho-social and behavioural aspects of paediatric cancer. The Unit is part of, and supported by, the Kids Cancer Centre, Sydney Children's Hospital. The Behavioural Sciences Unit is proudly supported by the Kids with Cancer Foundation Australia. 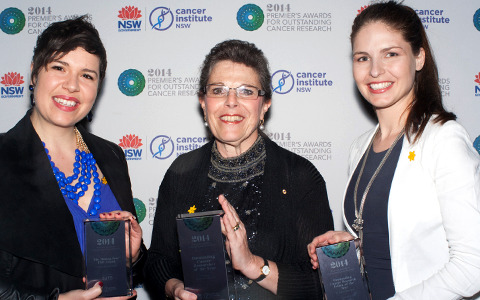 ​A team of researchers at the University of NSW under Professor Claire Wakefield are pleased to share progress of their patient-centred program for survivors of childhood cancer. To read more about the research update, please visit The Kid's Cancer Project website. More information on Re-engage and how to participate can be found here. How do you talk to a young cancer sufferer about possible death? Dr Ursula Sansom-Daly has received a $60,000 grant from the AYA Cancer Global Accord - a partnership between CanTeen Australia, Teen Cancer America and the UK’s Teenage Cancer Trust - to create training materials to educate healthcare professionals on how to initiate and navigate end-of-life conversations with adolescent and young adult cancer patients. Ursula Sansom-Daly wins Top 5 under 40 award! The winners of the 2017 Top 5 under 40 from left to right: Dr Sophie Calabretto, Dr Denton Callander, Dr Ursula Sansom-Daly, Dr Tom Raimondo and Dr Gemma Sharp. Dr Ursula Sansom-Daly received a Top 5 Under 40 Award (ABC/UNSW) in 2017, for her research on adjusting to life after cancer as a young person! Dr Ursula Sansom-Daly was interviewed by Dr Bradley J. Zebrack (the University of Michigan) at the 2015 IPOS conference in August, regarding the provision of supportive care services to meet the unique needs of adolescents and young adults with cancer. Click on the image to the left to follow a link to the video. Prof Claire Wakefield and Prof Richard Cohn were each interviewed on the radio recently, regarding the BSU's long term follow-up study. The two interviews followed on from this weeks Clinical Oncology Society of Australia's 41st Annual Scientific Meeting, held in Melbourne, where Prof Cohn presented early findings from the study. 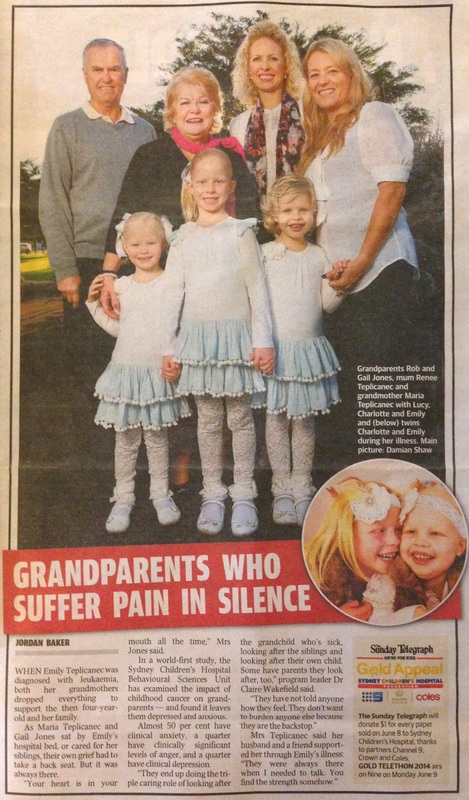 The article draws on the story of brave Emily Teplicanec, diagnosed at just 4 years old, and her family. Please click here to go to the full article, or on the image (left) to read the article full size. For more information see also the links below. Prof Claire Wakefield and the BSU are featured in an article in the Daily Mail UK after attending an invitation-only welcome reception with the Duke and Duchess of Cambridge as part of their Royal tour down under. Please see the links below for more information.